Travel Agency Maryland: Considering a Cruise? Summer vacation 2017 is almost in the can at this point, so it’s time to start looking forward to future vacations. Does the idea of another road trip with a car full of grumpy, impatient kids and adults with frayed nerves not sound like the way you want to spend your next vacation? Have you considered a cruise? You should! Cruises are a wonderful way to spend a family or couples vacation. You get a chance to get away from it all, but still have all the amenities that you want. 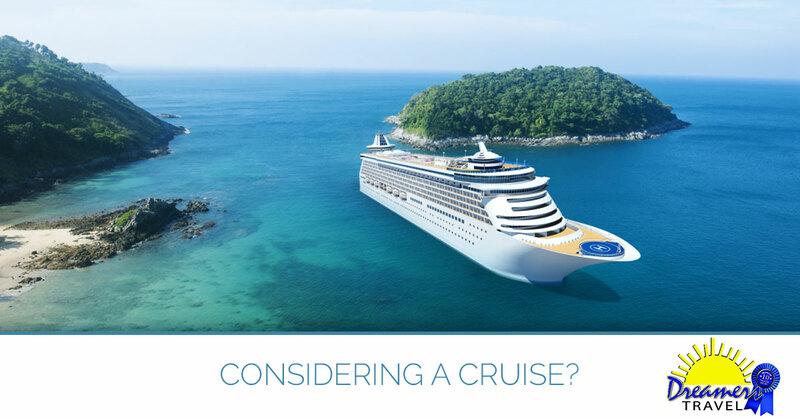 In this week’s article, we’ll take a closer look at some of the reasons you should consider a cruise for your next vacation! When you feel sufficiently tempted, call Dreamers Travel travel agency, based in Hampstead, MD, and we can set you up with a cruise that will make your vacation dreams come true. The cost of a cruise might surprise you. When you factor in the fact that you are being transported to a fun destination, have all your meals included, and have a wide variety of activities available to you and your family, the cost can be lower than other vacations. You won’t have to pay for gas, every single meal, and all the other costs that add up, from putt-putt golf to another stop at an ice cream stand. A bundled price can mean that you save money in the end. We can offer you a variety of cruises for you to choose from. We have honeymoon cruises so you can spend some quality time with your new husband or wife. We offer Disney Cruises for your family to have an amazing Disney experience without the interminable lines and the surging crowds. Tons of fun, safety, and convenience are just some of the reasons families choose a Disney cruise. An Alaskan cruise is a great way to enjoy a cruise through breathtaking scenery while checking items off your bucket list. On your Alaskan cruise, you’ll cruise through glacier-fed waters and see pods of orcas, seals, and other wildlife. When you use a Dreamers Travel travel agent, you get all the benefits we have to offer. We can make sure the cruise you get is the cruise you want. We are experts and know exactly what each line and each destination offers and can match you to a cruise that will be a dream vacation. We also know where the bargains are and how to get them for you. We keep on the on the latest group discounts, too. If you are new to the world of cruises you will want to use a travel agent. If you book your cruise yourself you can end up paying more, end up in a room you don’t like, and sailing to a destination that doesn’t, well, float your boat. When you want to know more about how a cruise can be the perfect vacation for you and your family, give Dreamers Travel a call, and we’ll make sure you have cruise vacation of your dreams!